The car maker Peugeot has been condemned in the Commons over the closure of its factory near Coventry. 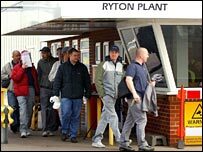 Jim Cunningham, MP for Coventry South, told Parliament he believed the recent decision to close the Ryton plant in January was a "callous act". Some 2,300 UK jobs are being lost when the French car firm switches production to Slovakia in a cost-cutting exercise. Industry Minister Margaret Hodge responded saying it was "a disaster" for those affected by the closure. Peugeot announced the closure plan in April and at that time said the plant would remain open until mid-2007. But earlier this month Peugeot said it would be closing in January. Mr Cunningham said: "I thought it was bit brutal, a bit callous to say the least, totally insensitive to make an announcement that just after Christmas the workers find themselves losing their jobs. "I think it was a callous act and as somebody once said that is one of the unacceptable faces of capitalism." The move has also been criticised by unions but Peugeot has said it was prompted by the number of requests from workers to leave early in order to start new jobs. Mrs Hodge, responding to Mr Cunningham, said she was optimistic about the future for the workers, saying they would be helped to find new jobs. But she agreed the plant closure had been a blow. "The loss of Peugeot is a disaster, I'm not in anyway wishing to mitigate that. It is a disaster for the lives of those who have been affected by it," she said.